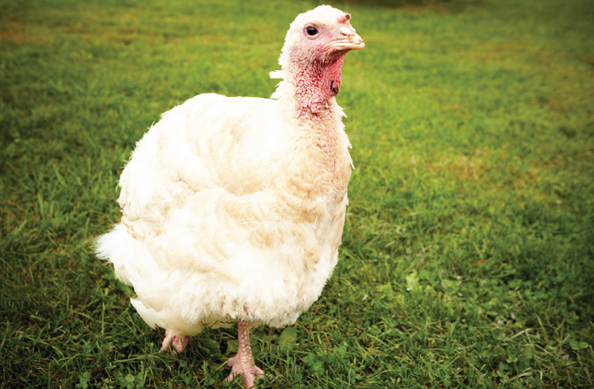 For the past nine years, Woodstock Farm Animal Sanctuary has been giving people an irrefutable reason to rethink tradition with its ThanksLiving event. Held in October on sanctuary grounds, the gourmet sit-down vegan banquet sets the tone for the holidays, and provides a hopeful glimpse into a future where animals are treated with dignity and respect. Before guests sit down to eat, the turkeys are served a special meal of their own, “which they devour along with relishing all the attention,” Jenny says. Its growing popularity (this year’s event sold out in less than 12 hours, with a waiting list of 250 people) could very well be an indicator of a shift in collective consciousness. Many of the guests drawn to this unique experience are not yet vegan, and they walk away changed. 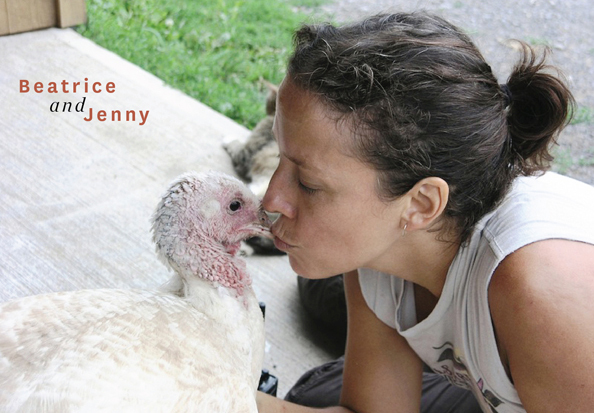 “To be at a place where animals are friends, not food; where they have names, not numbers—in a compassionate and peaceful setting, while eating a fabulous animal-product-free meal can be transformative,” explains Jenny. This year’s feast was prepared by Philadelphia’s Chef Rachel Klein and her team at Miss Rachel’s Pantry—who we profiled in our Second Issue. Here, we share two exclusives recipes from the event’s menu, helping you bring some of that ThanksLiving spirit home. And read on for time-saving meal ideas from NOOCH Vegan Market in Denver, followed by more insights from Jenny Brown, along with advocacy tips from New York City-based vegan psychotherapist April Lang and Dartmouth College activist Laura Bergsten. Put all ingredients in a pot; bring to a boil, then simmer until the sweets are tender. You can then allow the mixture to cool a bit and transfer to blender and puree until smooth, or use an immersion blender to create similar results. If the soup is very thick, you may want to add 1/4 cup more water, or so. We topped ours with shallots that were cooked in olive oil with rosemary and sea salt, and a little smoked coconut. Slice all of the stems off the Brussels sprouts. Set each sprout cut side down on your cutting board (make sure the cut surface is flat so that the sprouts don’t roll around!) and thinly slice/shave them with a sharp knife. You can also cut the stems off and put the Brussels sprouts through a slicer blade in your food processor (saves a little time!). Toss the Brussels, cabbage, cranberries and avocado together in a large mixing bowl. In a smaller bowl, whisk together all of the dressing ingredients. Pour the dressing over the salad, mix thoroughly, and allow to stand at least a half hour before serving. This recipe is actually a great make-ahead dish. It tastes best when it’s had a night in the refrigerator to marinate. Short on time? We asked our friends Joshua LaBure and Vanessa Gochnour of the Denver-based NOOCH, a thoughtfully-curated vegan market, to put together a shopping list of tasty party items that require minimum prep. Field Roast Celebration Roast. “This one is fantastic, not only on the holidays, but year-round! Rub with a salt and herb mix before roasting and enjoy the amazingly delicious crust that will happen!”  Vtopian Chive & Dill Cheese. “So creamy and bursting with flavor from the dill, it would make any omni happy at your dinner party.”  Tofurky Roast. “The one that started it all 20 years ago. 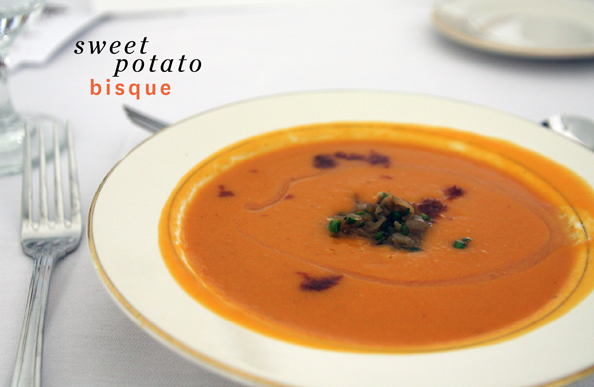 It’s a classic, and we absolutely love it (especially teamed up with their giblet gravy.) 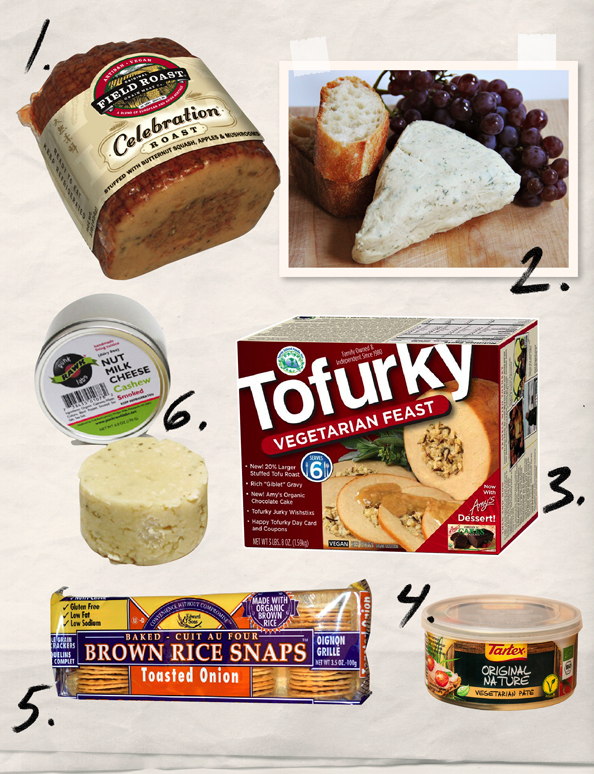 Save some for the next day, and make leftover Tofurky sandwiches.”  Tartex Vegan Pâté. “Vegan pâté! That’s all we really have to say about this. You either love it, or you hate it. We love it.”  Edward & Sons Toasted Onion Brown Rice Snaps. “These crackers have the perfect crunch and just the right amount of flavor to compliment your vegan cheese plate.”  Punk Rawk Labs Smoked Cashew Cheese. “This cheese is cashew-based, raw, rich, and features smoked sea salt and a pepper crust. This was the first vegan “fancy” cheese that we ever tried, and it’s still our absolute favorite. Last year, we brought some to a dinner party and our vegetarian friend—a self proclaimed “cheese lover” and skeptic of vegan cheeses—flipped out over how tasty it was. The next day she was at NOOCH buying herself a tin!” These items are stocked at NOOCH, and can also be found at your local health food store, supermarket, or online. • Whole pies from NYC’s Pure Food and Wine. Their new Banana Dulce de Leche Pie looks especially tantalizing. 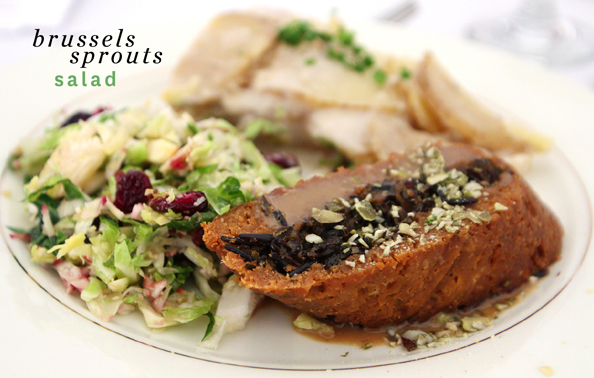 • Full Thanksgiving dinners from NYC’s The Nourishing Vegan. Chef Jenné Claiborne will prepare sumtuous dishes like Lentil Loaf, Butternut Squash Stuffing, and Sweet Potato Pie. • In Los Angeles, the vegan mainstay Real Food Daily is providing their organic Thanksgiving To-Go menu for the 21st year in a row. Choose from an array of traditional dishes like Corn Sage Stuffing, Rusted Root Vegetables, and Deep Dish Pumpkin Pie. Order by noon Tuesday, November 25th with all of these establishments for Thanksgiving. And be sure to check back with them in December for their other holiday menus. • Or head out and celebrate in style at LA’s Crossroads, which is hosting a four course Thanksgiving dinner 12-5pm on November 27th. For vegan college students, coming home for the holidays can be a complex experience. At Darmouth College, Laura Bergstein—who was one of the activists featured in our Premier Issue’s “The Youth” story—heads DAWG (Dartmouth Animal Welfare Group). One of the group’s goals is to “encourage students to think deeply about their choices, especially during the holidays when we all tend to do things in excess,” Laura explains. Animal rights groups on campus offer a much-needed sense of community to vegan college students, who may feel otherwise in the minority. Connecting with others who share your values and commitments fosters confidence and courage in speaking up for animals—especially handy during family gatherings. And with social media, it’s easier than ever to forge these kinds of connections. “Being around other vegetarians and vegans allows me to feel at ease in my choices, and they always support and inspire me to be better,” says Laura.